I've spotted Megan Lynn Kott's cat-centric artwork all around Brooklyn: at independent maker fairs and cat lady craft nights (yes it's a thing) - so it was bound to happen that we'd cross paths at last month's CatCamp. She is a super talented cat enthusiast (just our kind!) - here's more from Megan about her inspiration, her own kitties, and some pawesome upcoming projects! That Cat Blog: What is your background & how did you get into cat art? Megan Lynn Kott: I think I've been doomed to love cats from the start - my first word was "kitty." In conjunction with that I've always adored drawing. My mom used to tape pieces of paper to my high-chair for me to draw on. There is a very early drawing of one of my first cats floating around my parent's house somewhere. Later (much later) I went to art school in Detroit and then San Francisco. In the Bay Area I met up with my now husband who encouraged me to draw & paint more for myself. And what did I choose to start painting? CATS. This was somewhere around the first Oakland Cat Video Festival in 2013. I think that's when the focus on cat art really started. TCB: What is your favorite thing about creating a new design? MLK: I usually try to focus on things that make me laugh - whether it be pop-culture mashups with cats, a funny cat picture that inspires me, or I think of a phrase that a cat should be saying. That moment where you think of it - I think that's my favorite part: the conception of a drawing and it making me laugh out loud. TCB: Where do you get your inspiration? Do you have any cats these are based off of? MLK: For my most recent projects with Chronicle Books I tried to use all cats that I knew. I'm actually always on the look out for cute cat pics from friends (or IG friends). I also use my ginger cat Griffin a lot in my work. He's probably been a part of all the projects I've ever done involving cats (shh, don't tell my other two fur babies). In Megan's words.... "Griffin is a ginger tabby polydactyl - he prefers the freedom of outside from the comfort of a window seat, being a mama's boy, and arm-pit scritches." TCB: Do you have any upcoming projects? Tell us the inspiration behind those. MLK: My most recent projects with Chronicle Books come out this Fall (2017). 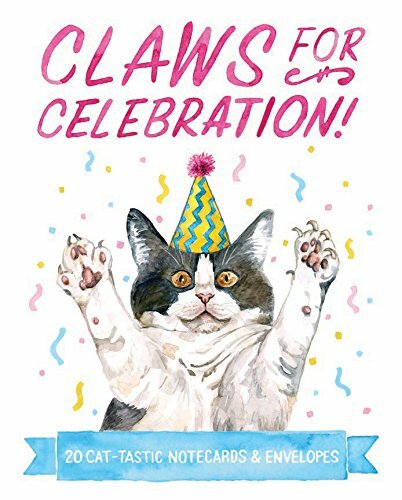 They are a greeting card set called "Claws for Celebration," and a card game called "Cat Lady Old Maid." What I really like about the card game is that it plays much like Old Maid BUT when you end up with the "cat lady" (aka Old Maid card) you WIN instead of lose. We are really trying to take-back the phrase "cat lady" and give it a cooler, less-creepy vibe. The Simpsons Crazy Cat Lady really ruined it for us young, hip cat ladies. Ha! TCB: Do you have any favorite projects to date? MLK: One of the first pop-culture mash-ups I did with cats was to recreate all the cast of Arrested Development as cats. That was really fun. Thinking about each of the characters and finding their fursona. Since then I've done a few other sets like that - but I think that was my favorite. TCB: You created a book of temporary "cattoos" - do you have any real cat tattoos of your own? MLK: YES! I actually have two. One is of my first cat "Frisky" I got when I was 7, and the other my husband & I got together. It's of our first cat together "Davos" with a banner that says "Be Brave." Says Megan: Davos the Onion Cat is a grey & white cow-cat - he prefers hiding to people, telling us about his feelings, and carrying around his fuzzy blanket. TCB: What is your main focus going forward and where do you see yourself in the future? MLK: I would love to keep making books - perhaps a children's book? I'm working on getting together a collection of work that I want to Kickstart into a book later this year as well. If I could paint animals for the rest of my life - I'd be a happy lady. "Thessaly is a white & tabby little girl. She's got an LA face & an Oakland booty - she prefers food, burrowing under covers, growling at her two brothers. She is happiest sleeping under a pillow in the comfort of our bedroom (her room) with the door closed so her brothers can't bother her." Go check out her awesome online shop and catch her at an upcoming event - she might be in your town next! Apr 21 NYC: 'Tats 'N' Tails' Adoption Event This Sunday April 23! Aug 24 CatastrophiCreations: Fun Furniture For Your Kitties!